549.01 Taking 1st place in 15-18 Duets Competition at Fleadh Cheoil na hEireann 2018, Caoimhe and Eimhear Ní Fhlannabhra from CCÉ, Teampall an Ghleanntáin, Limerick, play a Reel - “The Humours of Castlefin”. 549.02 From Moycullen CCÉ, Co. Galway, the Cogar Céilí Band play Jigs - “Gallagher’s frolics” and “The flying wheelchair” in Senior Céilí Bands competition at Fleadh Cheoil na hEireann 2018 in Drogheda, Co. Louth. Band members are - Fiddles: Meghan Davoren and Brendáin Ó hIarnáin; Flutes: Maidhc Ó Hénaigh, Neasa Ní Chonghaile and Mícheál Mac Fhlannachaidh; Accordion: Seosamh Ó Fartharta and Cormac Ó hAlmhain; Banjo: Sadhbh Ní Fhartharta; Piano; Ferdie Ó Faoláin; Drums: Paul McClure. 549.03 From CCÉ, Irish Musicians Assoc. IL, USA, Sophia Pagni plays a Reel - “In memory of Coleman” (Ed. Reavy), in 15-18 Fiddle competition at Fleadh Cheoil na hEireann 2018 in Drogheda, Co. Louth. 549.04 Taking 2nd place in Senior Trios competition at Fleadh Cheoil na hEireann 2018, Síofra Thornton, Keelan McGrath and Blaithín Kennedy, CCÉ, Ballycommon/Ormond, Nenagh, Co. Tipperary, play a Jig - “The humours of Ballyloughlin”. 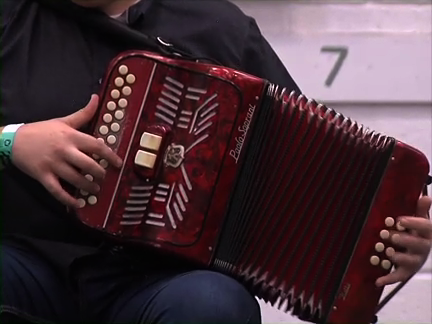 549.05 Taking 2nd place in Senior Button Accordion competition at Fleadh Cheoil na hEireann 2018, Séamus Tiernan, CCÉ, Cr. Caisleán a’ Bharraigh, Mayo, plays a Reel. 549.06 Eilidh Paterson, Michael Dudgeon and Gemma Blevins, CCÉ, St. James the Great, Scottish Region, UK, play a Hornpipe - “The plane of the plank”, in 15-18 Trios competition at Fleadh Cheoil na hEireann 2018. 549.07 Taking 1st place in Senior Duets competition at Fleadh Cheoil na hEireann 2018, Ciarán and Áine Fitzgerald, CCÉ, Cr. Bheartla Uí Fhlatharta, Kildare, play a Jig - “Kit O’ Mahoney’s”. 549.08 Selection played by Ceoltóirí Tireragh, Sligo, when taking 3rd place in Senior Grúpaí Ceoil competition at Fleadh Cheoil na hEireann 2018 in Drogheda, Co. Louth. 549.09 Micheál and Mac Dara Ó Raghallaigh play a selection of Reels commencing with “The whistler of Rosslea” (Ed. Reavy) at Scoil Éigse Tutor’s Concert at Fleadh Cheoil na hEireann 2018 in Drogheda, Co. Louth. 549.10 Kate and Maedbh Ní Shé and Mary Coffey, CCÉ, Niall Ó Cathasaigh, Baile an Chollaigh, Cork, play a Hornpipe - “The echoing strings” - in 15-18 Trios competition at Fleadh Cheoil na hEireann 2018. Comhaltas 549.11 Kyle Burghout from CCÉ, Ottawa Irish Arts, Canada, plays a Reel - “Leddy from Cavan” (Ed. Reavy) in Senior Fiddle competition at Fleadh Cheoil na hEireann 2018 in Drogheda, Co. Louth. 549.12 The Jig - “Helvic Head” - played by Niamh Ní Cheannabháin, Rachel O’ Dea and Arlene O’ Sullivan from CCÉ, Cr. na hInse/Ennistymon/Rockmount, Co. Clare, in 15-18 Trios competition at Fleadh Cheoil na hEireann 2018. 549.13 Taking 2nd place in Senior Céilí Bands competition at Fleadh Cheoil na hÉireann 2018 in Drogheda, Co. Louth, Knocknashee Céilí Band, CCÉ, Paddy Killoran, Sligo, play a Hornpipe - “The Eclipse”. Band members are - Fiddles: Caoimhe Kearins, Marie Barry and Dylan Carlos; Flutes: Mick Mulvey and Cian Kearins; Accordions: Daithi Gormley and Declan Payne; Banjo: Theresa O’ Grady; Piano: Catherine McHugh; Drums: Michael Sheridan. 549.14 Taking 1st place in 15-18 Fiddle competition at Fleadh Cheoil na hEireann 2018 in Drogheda, Co. Louth, Naoise Kettle, CCÉ, Spink, Co. Laois plays a Reel. 549.15 From CCÉ, Martin Mulvihill, New York, USA, Angela and Catriona Fee play a Reel - “The parcel of land”, in 15-18 Duets competition at Fleadh Cheoil na hEireann 2018.